Hello ladies! I can't believe I am actually posting something this today. I was supposed to be on a weekend getaway to Laoag and Vigan, but I missed my plane for the first time ever. How? Uh.. that's going to be a long story so let us just proceed to the part 2 of my birthday celebration from last month. Here we go!!! It was a pink party. I instructed my guests to come in pink. Clockwise from L to R: Honey, me, Jing, Nora, Bedz, Joy, Lyn, Askim, and Jen. The little one also dressed in pink for momma's birthday. She was holding a bath sponge (gift from Jen) in the photo. I prepared a variety of snacks, fruits and drinks. Plus, Jing and Jen bought me a yummy Red Ribbon cake. This one turned out to be the crowd's favorite.. my pink gelatine! The original recipe for this pink treat is courtesy of my Auntie Jo. Thanks to her! A cowgirl friend from Arkansas came make habol to my party, too. We missed you Jes. Hope one day we'll really see you again in one of our parties. thank you so much Miss Cel. I love your gifts to bits! More photos from the party. I grabbed these from Arnold, Honey's hubby, and Bedz. Sorry I had to turn them into a collage to make this post lighter. If there is pink party, there should be pink treats too, right? 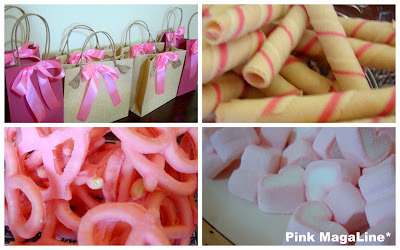 Here are the lootbags, strawberry Champola, pink mallows and strawberry pretzels. 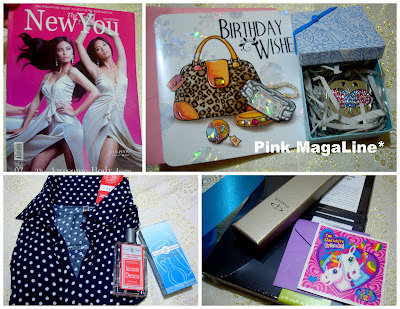 dotted top and perfume from Jing and Jen, then notebook, Parker pen and a small card from Bedz. I gave out a popcorn maker for the earliest bird to arrive at the party. Honey won the prize for coming 3 hours ahead. Wow, a record to beat! Haha!! To you my fabulous pink friends, thank you all so much. You know that day was FUN. I laughed a lot, shared stories and jokes with you ladies. There was a little drama too, but the bottomline was all fun. Hope to party this hard again next time. Thanks for being your friend. Love you all. Muah muah muah!!! Note: Link to part 1 is HERE. Wow, looks like a fun party! and I saw familiar faces too! I almost missed my plane on my way back home to Manila! Haha. Sweet friends you got there... I mean they really came in pink... it means even in their simple ways they want to make you happy! Not a single photo without the color pink. It was definitely a pink party and looks like you really had fun. Wow!!! nice post thanks for the friendship gurl more party!! 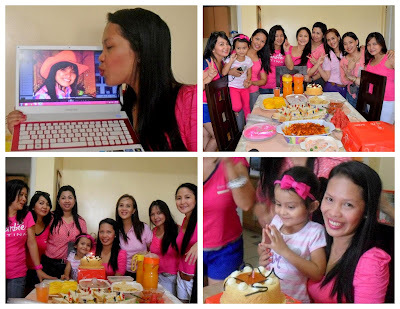 we're all pretty in pink haha!love it, love love all the photos.. love the food and lahat hihi.. more party to come, haha.. I like your idea sis. the gelatin topped with kiwi looks so yummy. photos look nice cos most of things around you are pink..